Like many others around the globe, I'm excitedly following the series Game of Thrones in HBO. I have heard a lot about the books, have seen them in the different bookstores I visit, but never really felt like reading them. Though I enjoy the series, the truth is that this kind of literature is not really my kind of literature. It just doesn't reach out to me. For instance, back when there was this huge hoot about The Lord of the Rings, I did go to the movies, I did saw them, but I never got the books nor ever felt inclined to read them. Then, today I was talking to a coworker of mine who is also crazy about Game of Thrones, and we were talking about the next episode (episode 7) will be the last of this season (season 7), and how rumor has it that the series has deviated from the books, and curiosity got the best of me: maybe I should read the books to get the other side of the story. The idea seemed appealing in the spur of the moment, and I even went online to Amazon.com and the site of my favorite local bookstore to compare prices, and started debating. You see, I'm normally not into book series. I trilogy I can still manage, but longer series are not my thing (except, clearly, in the case of LGBTQ romance stories, like Alessandra Hazard's Straight Guys series). 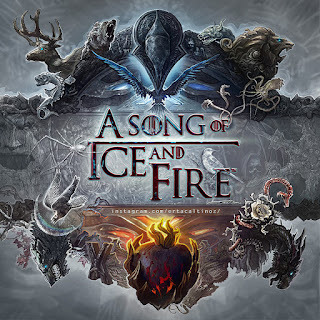 So, as I was checking the series of "Songs of Fire and Ice", it turns out not only that there are 5 or 6 books out, but that there might be 7 or more. This put a halt to my intent on getting them and reading them. So, basically the story is unfinished and nobody knows when will it be finished? Are readers supposed to spend years in suspense? And how well could a story be held up in such a condition? Will it have the backbone required to hold up so much story? I'm back at considering, pondering, clicking the pages of the online libraries off and considering getting from friends one of those free pdf copies that pululate around, just to see if it is actually worth my time. To try, to rest, to attempt to minimize the risk of getting involved in something that might cut the path of other readings and yet leave me perpetually on a cliffhanger. To read or not to read, that's the reader's dilemma.